You are at:Home»Portfolio Construction Channel»LISI Market Comment: Emerging Or Fading Contagion? Contagion by any other name would sting just as sharply. Yet the virulence of isolated financial troubles among a handful of EM countries appears to be contained by stronger global financial institutions, a functioning early warning system, and willingness to permit quicker multilateral and bilateral interventionsAnalysts first applied the term “contagion” to financial markets in 1997 to describe the external effects of the Thai currency devaluation on other Asian Tiger countries and beyond, an event that buffeted global markets and tanked oil prices to such an extent that a year later Russia defaulted on $72 billion in sovereign debt. Observers now wonder whether a bout of contagion may arise from one of several difficult situations facing emerging markets (EM) countries including Turkey, Argentina and South Africa, among others.Of course, spillover crises occurred before the Asian Financial Crisis, but the last two decades have seen greater interconnectedness due to expanding global supply chains and a shift in the nexus of manufacturing that does potentially raise the specter of yet another financial pandemic originating in EM. Yet, a lot else has happened over the last 20 years. While greater interdependence through trade and migration may suggest a heightened risk of contagion, in our view the international community has constructed a number of shock absorbers that, while not able to prevent another crisis, are likely to soften the blow when the next one does occur. We review the EM situation below, as well as upcoming Fed rate hike decisions and the LISI Investment Committee’s recommendations. At its late August meeting the Committee voted to keep steady its current Tactical Asset Allocations. We see support for equity valuations from strong corporate earnings, particularly in a US market helped by tax cuts and a cautious Fed. Still, we are wary of potential shocks from an escalating trade war and possible geopolitical flare-ups, and favor broad diversification. The risk of financial contagion travels through several vectors including trade, financial connections, investor confidence and capital flows. Since the 2008-09 financial crisis, many of the largest problem situations occurred in the developed markets, e.g., Portugal, Ireland, Greece and Spain. Those challenges were successfully navigated and throughout this time many countries have taken steps to reduce systemic risk. Certainly, greater acceptance of improved capital requirements for banks (the “Basel” agreements) have helped countries to solidify the foundations underlying their economies. Fewer countries now peg their currencies to the US dollar and the multilateral institutions have enjoyed greater success in helping to guide, via both advice and emergency financing, governments that find themselves under extreme financial pressure. We are back to the Emerging Markets as a source of volatility. Investors are left wondering whether contagion may again result in widespread market pain and a threat to the economic stability that has characterized the last few years in most major markets. Venezuela, Turkey and Argentina have headlined the recent tumult, yet investors have not hesitated to apply a wide brush to paint the tape red at signs of possible contagion, caused this time by a number of fundamental factors and the threat of trade wars. Rising US interest rates have contributed to an investor shift away from EM and back to developed markets. A persistently strong dollar combined with trade pressures can contribute to liquidity problems for highly leveraged EM countries. The recent Turkey volatility arises in that context, yet conditions in other EM countries are particular to each. In Argentina, the asset selloff and currency weakness are due in part to a gradualist approach to fiscal discipline by the Macri administration, yet is amplified by uncertainty over the incipient investigation into corruption in the “notebook” scandal. But Argentina has support, with the IMF reiterating its commitment, even if Argentina must change its fiscal targets, perhaps acknowledging the prospect that the “notebook” investigations could result in lasting public institutional strengthening. Meanwhile, South Africa appears to be slipping into recession alongside a rising current account deficit, and Venezuela’s troubles have intractable political roots. Relative Performance Since Great Recession. 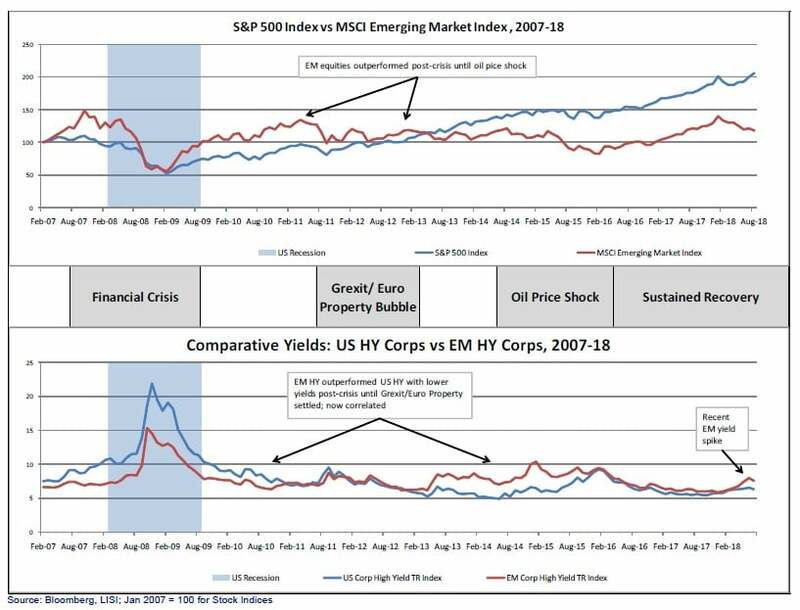 The performance of US equities and high yield compared to those of emerging markets has vacillated since the 2008-09 financial crisis. Perceptions of the relative safety of riskier assets in the US and in EM tend to correlate fairly closely, but then deviate during periods of global financial instability when flight to quality shuts the door on EM, particularly in those markets heavily reliant on basic commodity prices. Mapping relative returns since the beginning of 2007, four main periods mark changes in the perception of risk between US high yield bonds and Emerging Markets high yield. These are the Financial Crisis of 2008-09, the Grexit/Euro Property crisis in 2011-12, the Oil Price Shock of 2014-early 2016, and the full Recovery period from 2016 to the present. Since the main triggers of the Great Recession derived from the US and European property and financial sectors, markets there suffered initially, while aftershocks affected EM with the stark drop in trade and commodity prices. The US equities market recovered and began to outperform EM by mid-2013, and high yield spreads showed a similar pattern. Our charge is, of course, to try to gauge current conditions in the context of historical events and judge our best course of action going forward. 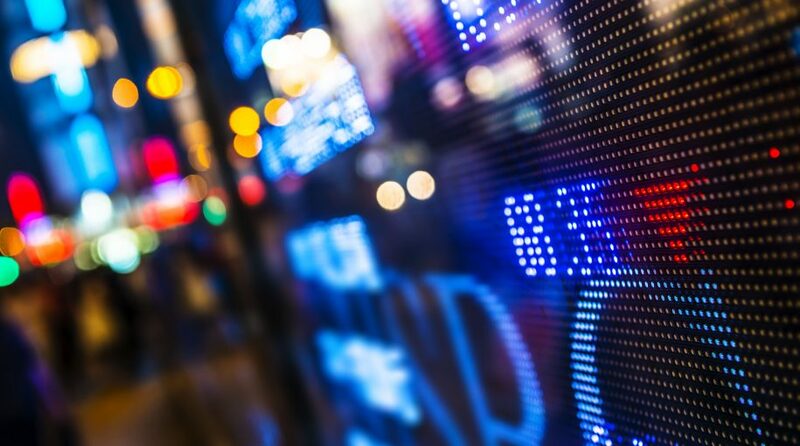 Based on this overview and a weakening outlook for international developed markets, we continue to favor US equities and high yield within the context of a well diversified portfolio. Focus on Liquidity. Sovereign and corporate defaults result more from liquidity issues than from solvency, so the adept management of near-term debt maturities affect the risk calculation greater than the leverage, or Debt-to-GDP, ratio. Elevated leverage does lead to high debt service that can boost current fiscal expenditures. Other factors also come into play: fiscal discipline and the effects of upcoming elections, currency shocks that make debt service more expensive, commodity price swings determined by international markets, and trade fluctuations resulting from protectionism abroad. In the case of the countries currently viewed as the most vulnerable – Argentina, Turkey, South Africa in particular – the relevant statistics show that leverage is not very high at about 50% debt-to-GDP or less, yet the current account deficits have reached worrying levels (see chart below). While we do not view Emerging Markets contagion as a significant threat to global asset values, we do want to remain vigilant for signs of possible Fed rate hike overshooting. At the same time, we note that despite the steady, slow pace of Fed rate hikes, the absolute level of interest rates remains quite low. For comparison, the Fed Funds rate stood at 5.5% as of June 2006, about a year before cracks began to appear in the foundation of the US housing market. Continued strong economic readings in the US give the Fed ample reason to keep hiking rates, with a highly probable 0.25% boost at its September 25-26 meeting that would take the target Fed Funds rate to 2.00%-2.25%. Currently, Fed Funds futures place the probability of a further hike in December at just over 60%. We are encouraged by the recent spate of strong economic numbers: a sequential 2Q18 GDP reading of 4.2% (2.8% YoY), jobless claims at a 49-year low, and business/consumer confidence touching peaks. Amid this good news the Fed’s core inflation indicators appear to remain under control as it hovers around the symmetrical 2% target.